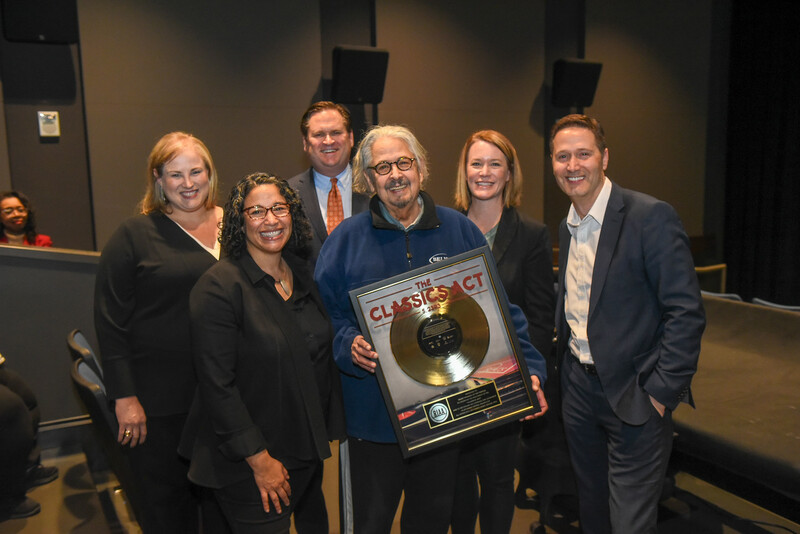 Mark Volman is recognized at Belmont University in Nashville, Tennessee, April 2, 2019. On April 2, the faculty and staff of Belmont’s Curb College of Entertainment and Music Business were present for a ceremony honoring one of its own, Mark Volman, assistant professor of entertainment studies. Volman was awarded a gold record by the Recording Industry Association of America highlighting his landmark lawsuit on behalf of his band The Turtles and other legendary recording artists against digital music companies. Volman’s lawsuit helped spawn the CLASSICS Act or Compensating Legacy Artists for their Songs, Service, and Important Contributions to Society Act, which was eventually incorporated into the Music Modernization Act. Volman argued in his lawsuit that digital royalty payments should be paid for pre-1972 recordings. The Music Modernization Act, with the CLASSICS Act encoded as Title II within it, was signed into law last October, finally providing federal copyright protection for sound recordings made prior to 1972.